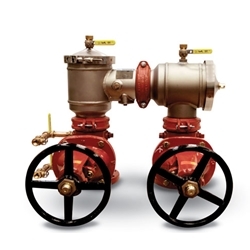 These backflow preventers feature NRS gate valves with N pattern. Strainers not included; FDA approved epoxy-coated cast-iron strainers are available (stock # 58872). Approvals: ASSE 1015‚ CSA B64.5‚ IAPMO‚ FM‚ NSF 372‚ AWWA 510‚ USC-FCCCHR. Overall Length (includes NRS valve): 27"